TRK offers the thickest shanks in the industry for rakes, negating the need for gussets, so nothing will impede the flow of material between the shanks, according to the manufacturer. Severe duty scoop rakes have an overall effectiveness for heavy applications and production land clearing, with thicker shanks with replaceable teeth drastically reducing maintenance over the rake's life cycle. The scoop design allows the operator to get right under stumps, big rocks and large roots. Another advantage is the scoop profile allows the operator to handle bigger loads of material, and easily sift out the dirt. All TRK severe duty rakes are 5th generation designs. The geometry, grades and thicknesses of steel are all optimized for the best cost weight ratio, with angled cutting edge slicing through roots at the perfect angle, according to the manufacturer. 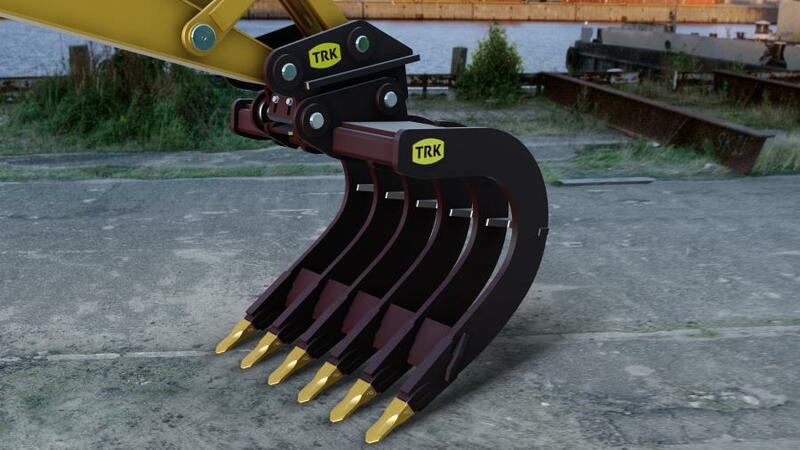 TRK offers the thickest shanks in the industry for rakes, negating the need for gussets, so nothing will impede the flow of material between the shanks. The extra thick shank is self-supported and longer than other rakes, allowing for deeper unimpeded ground penetration. TRK sources high quality steel from both the United States and Canada, according to owner Thomas Knapp. "It's the small details that make a quality product. Our customers come to us again and again because they know we take pride in what we manufacture. Our steel is always preheated to 300F before welding, never exceeds 500F for interpass welds and we only use top quality metal core mig wire." Angled cutting edge slices through roots at the perfect angle. The extra thick shanks are self-supported and much longer than other rakes, allowing for deeper unimpeded ground penetration. Thickest shanks in the industry. Constructed from T1 & AR400 Steel at all critical points. Made by hand with superior craftmanship to ensure a quality like no other. Includes a 2 Year Limited Warranty. Designed for 8 to 60 ton excavators. 36 to 84 in. widths available, depending on machine weight class. Available in "Scoop" shape or in a "Standard" root rake shape. The right combination of hardened steels (AR400) and structural steel (50W) so that the rake has some flex where necessary. Properly cleaned and prepared steel before welding. Ground edges for deeper penetration. Quality control staff with heavy equipment backgrounds. For more information, visit www.trkattachments.com.